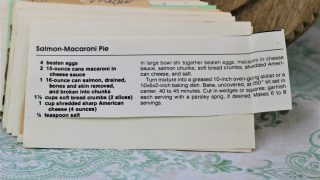 Front of the recipe card for Salmon Macaroni Pie. 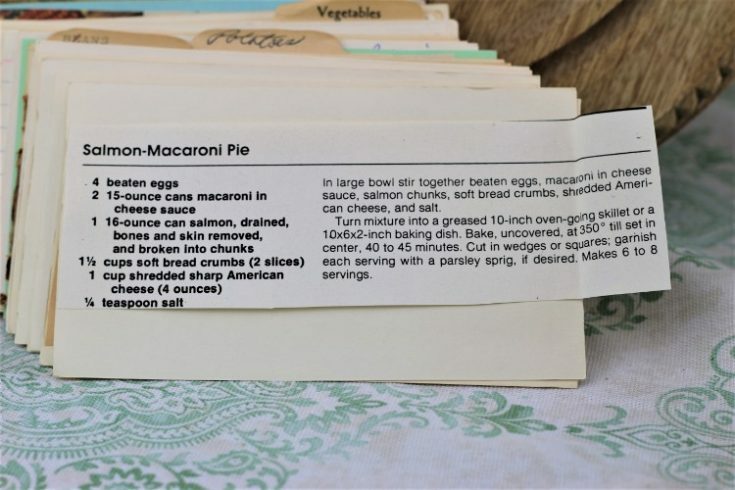 There are lots of fun recipes to read in the box this recipe for Salmon Macaroni Pie was with. Use the links below to view other recipes similar to this Salmon Macaroni Pie recipe. If you make this Salmon Macaroni Pie recipe, please share your photos and comments below! In large bowl stir together beaten eggs, macaroni in cheese sauce, salmon chunks, soft bread crumbs, shredded American cheese, and salt. Turn mixture into a greased 10-inch oven-going skillet or a 10x6x2-inch baking dish. Bake, uncovered, at 350° till set in center, 40 to 45 minutes. Cut in wedges or squares; garnish each serving with a parsley sprig, if desired.